After answering a distress signal from the U.S.S. Enterprise, season two finds the crew of the U.S.S. Discovery joining forces with Captain Christopher Pike on a new mission to investigate seven mysterious red signals and the appearance of an unknown being called the Red Angel. While the crew must work together to unravel their meaning and origin, Michael Burnham is forced to face her past with the return of her estranged brother, Spock. Ten years before Kirk| Spock| and the Enterprise| the USS Discovery discovers new worlds and lifeforms as one Starfleet officer learns to understand all thingsalien. The most dynamic, cutting edge Star Trek series produced to date. Every episode is "edge of your seat" entertainment. Production, direction and actor craft reaches above and beyond all prior franchise endeavors. This is NO LIMITS Star Trek. It's hard/impossible to find an online review of the full season. The full 15-episode Season 1 is available on Netflix here in Europe. Access in the USA is via other paid services, at least on initial release, but American viewers might be able to catch up with this on Netflix if they travel. Meanwhile all initial reviews are based on the pilot (episodes 1 and 2 combined). The pilot attracted good reviews - more than the full season deserves - in part simply from the pleasure of seeing a new Star Trek series on screen. By the end of Season 1, it feels uneven. There are some great ideas lurking in this, but it also has some serious issues: bad pacing, terrible acting in parts, and some obvious signs of a limited budget. Highlights: * Jason Isaacs as Captain Lorca is one of the best Star Trek captains: tough, bold, decisive, commanding, but also human and flawed. * Sonequa Martin-Green is a fine protagonist and very watchable - it's interesting that the captain is not the main character. She successfully portrays an upright, capable but insubordinate character through the season's full story arc, and it's all plausible. A shame that her Vulcan upbringing doesn't come into the story so much in the season's later episodes. * The romantic relationship given most screen time is between two men (a timely 21st century update in Star Trek's long tradition of diversity). It is well handled: we see that these men have a strong and loving relationship and there is a deep emotional hit later when one of them is harmed. * The subtitle options include "Klingon". Lowlights: * The Klingon race has been "rebooted" as a race of cumbersome, slow, religious nuts. The prosthetics look nothing like earlier incarnations of the Klingons. The idea of these beings as the galaxy's fiercest warriors is preposterous. A serious design mis-step here. * The timeline here predates the Original Series by around 10 years, but the Discovery appears to have more modern (and far more reliable) technology than the Enterprise ever did, even though this is supposed to be an older vessel. The uniforms also look more up-to-date. These things are going to irritate the fans. * In an entire 15 episode season the crew visit a grand total of ... three planets. I guess this minimises production expenditure on location shoots, but it severely limits the sense of adventure and discovery. Even a low-budget sci-fi show like Killjoys (excellent if you haven't seen it yet) has more planets than this. * Michelle Yeoh - I don't know if she is unwell or what, but this formerly great actor ruins most of the scenes she is in. She can't even say simple lines correctly (her intonation is wrong and the wrong words are stressed). If this is an intended effect then it's extremely badly portrayed. Her character here is supposed to have a Malaysian accent (we know this because at one point she explains that she was born in Langkawi - that's an island in Malaysia) but Malaysian people don't maul English like this. Overall just a shame: presumably a good chunk of the acting budget was spent on this headline name, and she's easily the worst actor in the show. A series like Star Trek wouldn't be complete without its special effects. Here again there is a mixed bag: some beautiful work with the 'mycelia' and the general space scenes are pretty, though it all seems a bit static. The bridge and ship interiors are too sparse - Engineering lacks any sense of powerful forces being held in check by advanced machinery. A trick shot where the camera moves from outside the ship, through the window/view screen, to the interior of the Bridge is used over and over again - nice the first couple of times. Overall grade B. It feels like a missed opportunity to bring this much-loved franchise up to date. Non-fans are likely to give up on this before the end of the season, and I can't really blame them. Fans are going to be, at least, annoyed. There have been other recent geek favourites which have disappointed, even though they have had big budgets and big names involved. Batman vs Superman: Dawn of Justice is the clearest example. I believe the root cause of these problems is that studios put key people in charge, as producers or directors or screen writers or casting directors, who are just not that into the source material. Some people think that sci-fi fans will swallow any old rubbish. That is patronising and it is a mistake, especially in this era of vast viewing choice. Fans hate to be patronised. The fans are looking for movies and TV shows made with integrity, respect and love. Anything made with that level of care will have no problem attracting new, younger fans. The positive audience reaction to Star Wars: The Force Awakens is a fine example. Star Trek: Discovery was - you would hope - aiming for that target. It does have some of the elements right (Captain Lorca puts on a splendid Scottish accent at one point). But overall it does not make the grade. Basically, the whole thing is a politically correct propaganda show. Everyone is an independent and capable woman. The only white male in a position of power is a single capitan, his with his flaws too. The rest? Incredibly obvious. Episode 10 is about a parallel universe in which - although the human race rules over everything, it's painted as an evil 'Terran Empire' and villified to the max. Everyone is evil. Why? Because the core mantra of this alternate human race is - listen to this - preserving their own kind (basically, they made an episode about just how bad a racist universe might be). Ridiculous. Watch The Orville instead, it's 100 times better and has none of this political crap in it. Our movies and show should be politics free. The first season of Star Trek Discovery I can only describe as awful. Like the vacuum of space it was sucked dry of the warmth and sense of hope and optimism found in the wonderful 1990's series. It came as a relief that the writers and producers listened to fans and crafted a much improved second season. That said, the hangover from season one remains and its uncomfortably starchy militaristic vibe, has not completely dissipated. To add to the series woes there is, of course, competition from the truly wonderful series "The Orville" which many long time fans, including myself, feel is the true successor to the older Star Trek series. Its upbeat vibe, well timed humour and its sense of optimism and thoughtful approach make it addictive viewing. In short not a dismal addition to the Trekkie universe but one that has a long way to go to redeem itself too. 5/10 from me. 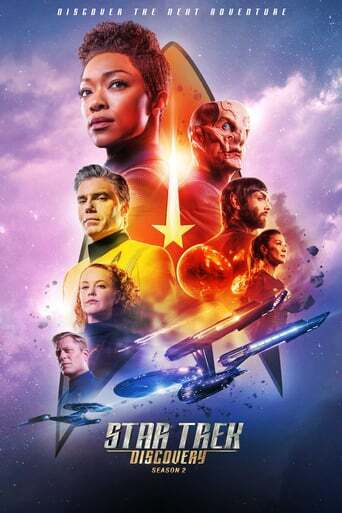 Downloading Seeding Star.Trek.Discovery.S02E12.720p.WEBRip.x264-TBS[rartv] from to 0 peers.